Rodgers himself threw for 259 yards and two TDs in only the second meeting of the two great quarterbacks, but it wasn't enough for the Packers as 14 unanswered fourth-quarter points saw the Patriots streak clear. The Patriots retook the lead before half-time on the strength of Cordarrelle Patterson's five-yard touchdown run, but Rodgers again brought Green Bay level with a 15-yard pass to tight end Jimmy Graham in the third quarter. 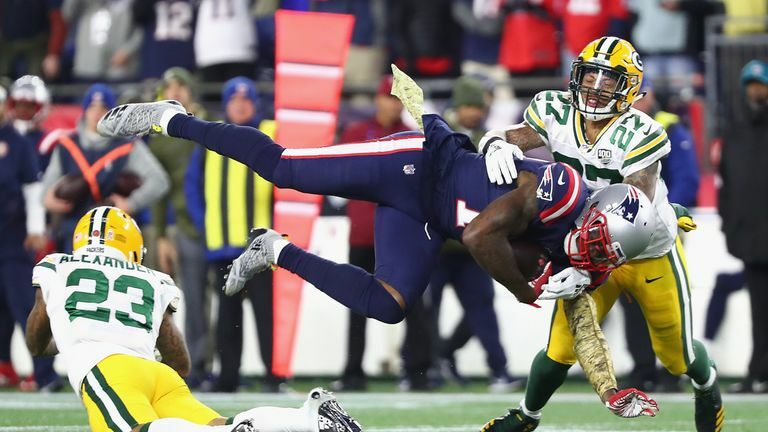 At 17-17, and with the Packers driving deep into Patriots territory looking to take the lead later in the third, Aaron Jones crucially lost a fumble for Green Bay. New England made them pay, as receiver Julian Edelman hit White on a 37-yard catch-and-run to set up White's second score, and then on the Patriots' next possession, Brady connected with Josh Gordon for a 55-yard TD to ice the win.